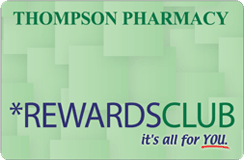 When you sign up for a Thompson Rewards Card you instantly begin earning reward points! For every 500 points you earn you’ll receive a $10.00 coupon good towards anything in the store! No minimum purchase required. What’s even better, you receive a point for every dollar you spend! Plus, coming soon, extra rewards! Reward opportunities for Rewards Card Members only! Be watching for special information and opportunities soon! Stop in or call any of our five locations to get yours today! *No points accrue on lottery, bill pay, money order, money gram, post office, milk, bread, or cigarettes by law.